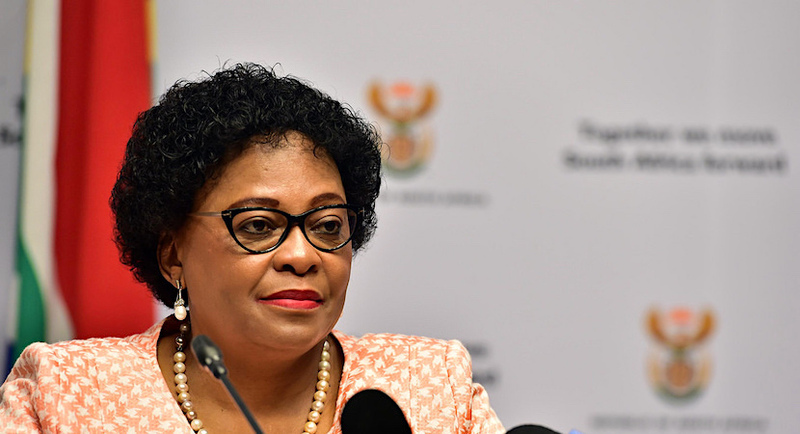 Environmental Affairs Minister Nomvula Mokonyane allegedly received cash bribes of R50,000 over the course of several years from a facilities management company, Bosasa — at times delivered to her at her official residence as the Premier of Gauteng. Mokonyane, a senior ANC leader who also happens to be the chairperson of the party’s disciplinary appeals committee, was appointed to Cabinet by former president Jacob Zuma in 2014. Her name featured prominently during testimony by Angelo Agrizzi, former Bosasa COO — the man responsible for “packing” the cash bribes into grey bags for delivery and who kept a record of payments in a little black book that was usually left in one of several safes in the vaults at Bosasa’s Krugersdorp offices. Capture Canary. More of Zapiro’s brilliant work available at www.zapiro.com. On Monday, Agrizzi told the State Capture commission that he was present, several times, when Bosasa CEO Gavin Watson allegedly made trips to Mokonyane’s homes in either Bryanston or Krugersdorp to drop off the cash. He gave commission chairman, Deputy Chief Justice Raymond Zondo, a detailed description of the swimming pools, the stairs, the path lights and even the boardroom furniture or location of Mokonyane’s home office — because he had gone there, he said, several times. Details of Agrizzi’s statement leaked at the weekend, but the minister’s office released a statement saying she was unaware of being implicated by him — it is unclear whether she will comment now that his testimony has been screened on live TV. Daily Maverick has reached out to Mokonyane’s office and will update this article when a respond lands. In the meantime, eNCA reports that Mokonyane has sent the commission a lawyer’s letter about not having been given prior notice, as per the rules of the commission, that she was implicated by Agrizzi’s testimony. It is important to note that Agrizzi’s testimony, like that of many of the witnesses who have testified thus far, remains untested and may still be challenged by implicated parties. Already Armscor CEO Kevin Wakeford, who is named in Agrizzi’s affidavit before the commission, has applied for special leave so he can prepare a response to claims. Agrizzi, a self-confessed kingpin in the Bosasa corruption empire, testified that he was personally responsible for packing the bags of cash required for bribes — including that allegedly paid to Mokonyane on Eccleston Crescent, Bryanston where she lived as Gauteng Premier. But after becoming fed up about Bosasa’s overall bribery operation, he said that he asked Watson why they couldn’t just switch to doing business the normal way — without their political connections. The conversation, he said, continued during a drive from the home of former Correctional Services commissioner Linda Mti to that of Mokonyane, where they had allegedly gone to drop off cash. Pressed for more detail, Agrizzi explained that while the bribe system worked well at other state-owned entities or departments, Mokonyane later on proved to be less effective as she provided them with absolutely no benefit for the money. He detailed how Bosasa at some point prepared two reports for security at Gauteng government facilities, including hospitals, had spent more than R3m on those and yet there were no tenders for the company in the end. “When we first met Nomvula Mokonyane we realised she was extremely powerful. “We referred to her as energiser bunny. The reason is that whatever we needed, it would be done. If we needed protection, needed people spoken to, it would be done,” Agrizzi testified. However, he said he tried to put a stop to her payments later on when he realised they were not getting value for their money. But Watson, he claims, allegedly said that Bosasa still needed Mokonyane on-side. “We knew she was very close to (former) president Zuma but further than that… if people in the Hawks needed to be spoken to, it would be done,” Agrizzi told the commission. The company had been the subject of various serious corruption investigations at the time and had allegedly lobbied politicians extensively for “protection”. It’s interesting that Minister Nomvula Mokonyane’s letter responding to #AngeloAgrizzi’s testimony says everything except “The allegations are untrue. I did not receive a cent or a case of drinks or a bottle of whiskey or a braai pack from Bosasa.” That’s all it needed. In addition to Mokonyane, Agrizzi detailed payments to several officials at the Department of Justice and Constitutional Development (DOJ) who had allegedly assisted Bosasa to land a lucrative security contract at the country’s courts. He named three out of four DOJ officials and said he was physically present when they were paid. There was a group of seniors at the DOJ who were paid directly by a politically connected “consultant” to Bosasa, Sesinyi Seopela. Seopela, Agrizzi said, would be given bags of cash for distribution — he then testified that he was told that some money was allegedly earmarked for Dr Khotso de Wee, secretary of the State Capture Commission who stepped down pending an investigation when the allegation first surfaced. Agrizzi claims that Seopela told him “verbally” that De Wee was one of the beneficiaries. However, Agrizzi said he had no evidence that De Wee was indeed the recipient of part of a R2m bribe distributed to various officials at the DOJ. He touched briefly on a similar payment system for officials at the Department of Transport for whom Bosasa subsidiary, Kgwerano Financial Services, administrated a fleet management system. In this case, bulk cash would either be given to Seopela or other seniors in the company. When the money was packed and ready, Agrizzi said he then had to call and drive around to get it to Seopela. This would be either at Monte Casino’s Palazzo Hotel or wherever Seopela was. “Sometimes it was in a restaurant, like Fishmonger at Thrupps (in Illovo), Tashas in Morningside or I would follow him to some obscure road and stop to hand it over. He says he personally handed over cash for distribution to either Seopela or the other seniors in about 30% of cases but handled the payments himself 70% of the time. If it's true that Nomvula Mokonyane was bribed with meat and booze, this is fantastic news for climate activists. How great to have a Minister of Environmental Affairs you can influence with a chop and a bottle of Late Harvest? Much of Agrizzi’s testimony related to Bosasa’s contracts at Correctional Services, a cash-cow for the company for more than a decade. On Monday afternoon he got down to the nitty-gritty of Bosasa’s alleged corrupt relationship with officials at Correctional Services. This government department initially cost the company R500,000 a month but spiked to R750,000 when Tom Moyane became the Correctional Services commissioner. 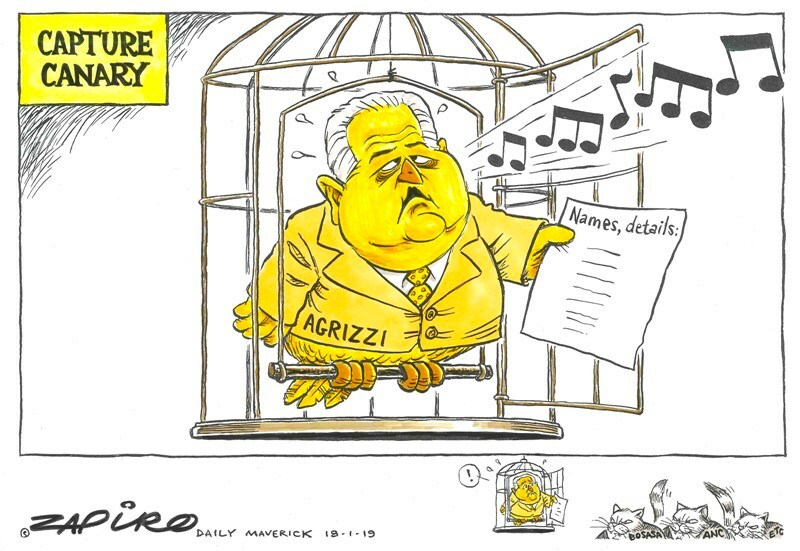 Agrizzi did not testify about payments to Moyane and merely said that the extra cash was required to accommodate some of the new entrants at Correctional Services. He also provided testimony about how in at least two cases, Bosasa was asked to conduct site inspections at some 20-odd prisons for a report on what Correctional Services needed and that this information would then inform the specifications for tenders worth hundreds of millions of rands. In both cases, Bosasa won the contracts. He also detailed how Bosasa, after battling at first, managed to rope ANC MP Vincent Smith, then chairman of the parliamentary portfolio committee on Correctional Services, and fellow ANC MPs and Correctional Services portfolio committee members Vuselelo Magagule and Winnie Ngwenya into their network. Agrizzi testified to a meeting with Smith, Watson and two other MPs at a hotel in Rivonia, Johannesburg, where the terms of their engagement were confirmed. The trade-off, he said, was that the MPs would “keep quiet” or ignore negative publicity around Bosasa when issues were raised in Parliament, thereby ensuring that the company’s business prospects were not harmed. Their alleged reward was initially R45,000 for Smith and R30,000 and R20,000 for his fellow ANC MPs. He said he occasionally paid them in person “when (Gavin Watson) was unavailable”. He says Smith would be paid at the Mugg & Bean, or the mezzanine level of Clearwater Mall on Johannesburg’s West Rand, or Cradlestone Mall. The bag of cash would be hidden inside a folder or a newspaper.